Stocks cut their dividends for a variety of reasons. A few of the major reasons for a dividend cut or suspension include deteriorating financial performance, too much debt, or the desire to use the money for another purpose, such as a large acquisition. Whatever the reason, a dividend cut is one of the worst outcomes for income investors, and stocks that are in danger of cutting their shareholder payouts should be avoided. With that in mind, this article will discuss tobacco company Vector Group Ltd. (VGR). Unlike other tobacco companies like Altria Group (MO) that have maintained generous dividend payouts for years and should continue to raise their dividend, Vector Group is at high risk of a dividend cut in the near future. Vector Group has a unique business model. It is both a tobacco company, and a real estate company. It operates two businesses that are entirely unrelated to each other. 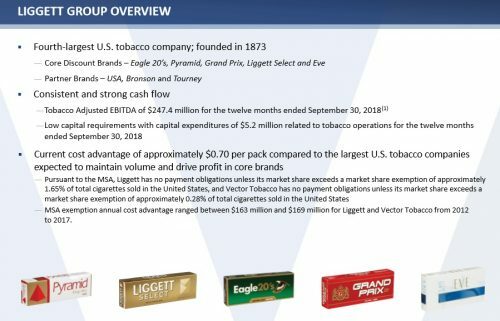 Vector owns tobacco subsidiaries including Liggett Group and Vector Tobacco, along with the New Valley real estate business. The company’s total revenue mix is roughly 60% tobacco to 40% real estate. Vector’s core cigarette brands include Liggett, Eve, Grand Prix, Pyramid, Liggett Select and Eagle 20’s. In real estate, Vector’s New Valley business owns 70.59% of Douglas Elliman Realty, a diversified real estate company. In the most recent quarter, revenue increased 6% against last year’s Q3 to $514 million. Strength came from a 2.7% increase in sales volume for the tobacco business, which helped Vector produce a similar gain in revenue. This increase was a slight improvement on the company’s 2% year-to-date volume gain for this year. Market share increased to 4.2% from 3.9% in the year-ago period thanks to the volume gains. Vector’s cigarette shipment volumes increased for the quarter, while the broader tobacco industry suffered a 4.8% decline in shipments, allowing Vector to gain market share against its competitors. Operating income for the segment was essentially flat year-over-year as margins declined slightly, offsetting volume gains. The real estate segment grew revenue by 11% for the quarter, as closed sales volume rose 11% as well. Net income for the segment more than doubled to $10 million during the third quarter. In total, adjusted earnings-per-share declined 6.7% for the quarter, to $0.14, as the cost of sales for both segments increased at rates higher than that of revenue. One of the most important factors when evaluating a company’s ability to pay dividends is the status of its balance sheet. The balance sheet lists the assets of a company along with who has claim to those assets—debtholders or stockholders. A highly indebted company has a greater burden than a company without much debt, because issuing debt requires repayment along with interest. In this case, Vector’s balance sheet is another major concern for investors buying the stock due to the high dividend yield. Vector has $1.06 billion of long-term debt on the books. This is interest-bearing debt, a problematic scenario for the company, as its cost of debt is very high. Vector has a credit rating of ‘B2’ from Moody’s and ‘B’ from Standard & Poor’s. In both cases, these ratings fall into the non-investment grade category, otherwise known as high yield or “junk”. Put simply, a company with non-investment grade credit ratings pays a much higher interest rate when it issues debt, due to its challenged financial condition. For example, on October 31st Vector issued $325 million of senior notes due 2026, with a 10.5% interest rate. This is a very burdensome cost of capital, and with interest rates on the rise, future issues will only get more expensive. For example, last quarter Vector Group’s interest expense rose by 18%. And, since equity holders are subordinate to debt holders, debt requirements are satisfied before dividends are paid to shareholders. If Vector Group has difficulty paying its debt at any point in the future, dividends will have to be sacrificed. Ultimately, a company’s ability to pay dividends to shareholders depends on its earnings and cash flow. A company cannot distribute more than it brings in. One way to measure this is the payout ratio, which simply divides the current dividend by the company’s earnings-per-share. On this basis, Vector’s dividend does not appear to be sustainable. Over the first three quarters of 2018, Vector generated adjusted earnings-per-share of $0.36, a decline of 27% from the same nine-month period last year. Meanwhile, Vector paid regular dividends of $1.20 per share to common stockholders over the first three quarters of 2018, equivalent to a payout ratio of 333% in that time. 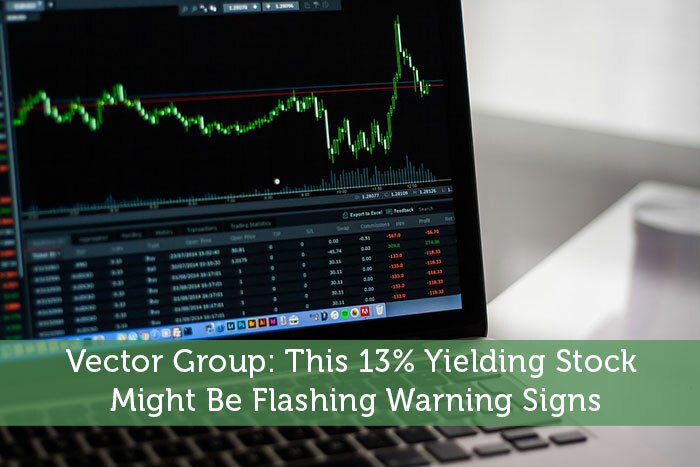 Not only that, but Vector also typically issues an extra 5% annual payout in the form of a stock dividend. A payout ratio significantly above 100%, in conjunction with declining earnings and a poor credit rating, is a dangerous combination as far as the dividend is concerned. A company can continue to make dividends above its rate of earnings for a time, if it chooses to raise debt and issue stock to fund the payouts. However, over the long-term this is unsustainable. To be sure, Vector’s financials look better through the lens of adjusted earnings before interest, taxes, depreciation, and amortization (EBITDA). From this perspective, Vector’s adjusted EBITDA of $187.9 million through the first nine months of 2018 works out to per-share adjusted EBITDA of $1.33 based on 140.91 million shares outstanding as of November 2. This was enough to cover the $1.20 per share dividend over the first three quarters. However, investors should be wary of relying too heavily on EBITDA, which excludes material items like depreciation and interest expense that do affect a company’s ability to pay dividends. Vector’s high dividend yield of 13.5% is very appealing to income investors. Adding in the 5% annual stock dividend results in a total dividend yield of 18.5%. But investors should view extreme high-yielding stocks with skepticism and caution. As the old saying goes, if something looks too good to be true, it usually is just that. When it comes to Vector, its sky-high dividend yield does not appear to be sustainable, and sizeable a dividend cut is likely in 2019 or 2020.